If you're looking for a way to secure your home or small business or if you already have an Arlo system in place and want to expand it, there's a nice deal over on Amazon for a 2-pack of the Arlo Q 1080p cameras. These are AC-powered security cams with 130deg wide-angle lenses, night vision, motion detection and activity zones, optional 24/7 recording, 7 days of free storage (upgradable), 2-way audio. They're not weather-proof and can't work without power, so you will be limited a little in where you place them, but they should do the job indoors. The cams can be scheduled to arm and disarm, but if you want more flexibility over their control, you can integrate them with SmartThings, Wink, IFTTT, Stringify, and Telguard. Last month, we spotted this 2-pack at $280 on Amazon, but today it's down $20 more to $260. The MSRP is $350 so this is a nice savings of $90. 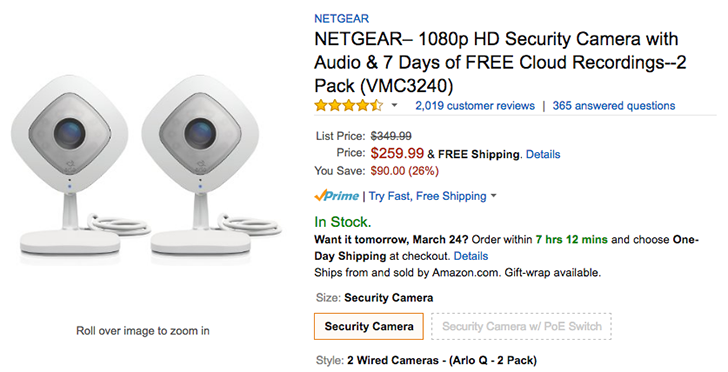 If you take into account how much a single Nest or Canary camera costs, this 2-pack is an even sweeter deal. You can check it out at the link below.